Announced and released last week in the US, the ZTE Axon will also be available in Canada, but only starting next month. It looks like the Axon will be released just via Fido (at least for the beginning), which plans to offer it for $0 (zero bucks) with a 2 year contract agreement. Mind you, this ZTE Axon isn't the high-end Axon Pro, which sports a Quad HD screen and is sold unlocked in the US for $499. Instead, it's a similar-looking, metal-made device that comes with mid-range features. For example, the 5.5-inch screen of the regular Axon only offers 1080 x 1920 pixels, while the processor inside the phone is a slightly old quad-core Snapdragon 801. The Axon further features LTE connectivity, 2 GB of RAM, 32 GB of non-expandable internal memory, and a 3000 mAh battery. 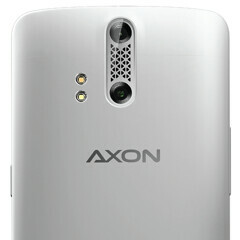 Like the Pro version, the regular Axon offers a dual rear camera (13 MP + 2 MP) with dual LED flash, and an 8 MP front-facing camera. Fido will start selling the ZTE Axon on November 6. At the moment, we don't know if the ZTE Axon Pro will also be available in Canada. It looks much better without that leather..